About Picture of the Day @Wisdomsdoor, Human Chakra System: The HCS is made up of 13 energy spheres that emit specific and distinct energy patterns. These energy patterns are like organs for the nonphysical body. They supply nourishment and system balance on an energy level. You are energy! Even quantum physicists agree that the human body is nothing more than energy held together by quantum mechanics. With that said, the idea of having discrete energy components to the human (and eternal spirit) is not such a foreign idea. With this picture of the human chakra system, I wanted to break up the idea that any of the chakra come before or after any other chakra. I also wanted to demonstrate that while these chakra may appear to be in the same place on the body, on an energy level nothing is ever in a static condition or in the “same” place. If you could see your chakra on an energy level you would see them whirl around your energy form like electrons whirl around an atom. 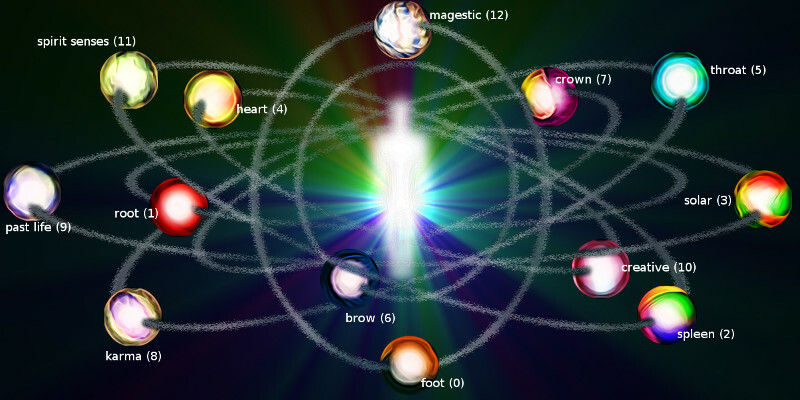 Normal Chakra: foot, root, sexual, solar plexus, heart, throat, brow, crown. Spiritual Chakra: karma, past life, creative, spirit senses, majestic. You are Energy! You are Spirit!